Hats Off For Cancer collects and donates hats of all kinds to the courageous children who lose their hair due to cancer treatments. As one of the leading and original hat programs, Hats Off For Cancer has donated nearly 3,000,000 brand new hats to hospitals, camps, and individuals worldwide since 1996. Hats Off For Cancer is recognized by the IRS as a 501 (c) 3 non-profit organization. In 1992, after losing her grandfather to prostate cancer, Tara (Lawrence) Bracher knew she had to turn a negative and devastating situation into a positive one. She began volunteering with the American Cancer Society in 1994. Tara was able to meet and talk with children who were battling cancer or who were cancer survivors. One common statement was repeated during each conversation, the children did not like losing their hair due to their cancer treatments. That was the beginning of Hats Off For Cancer. In 1996, Tara began a national letter writing and telephone campaign asking for donations from local and national companies, public officials, celebrities, schools and civic organizations. Through the next year, newspapers, magazines and television news shows interviewed Tara about her program. She has been featured on many local and national news shows throughout the eight years of HOC. National and local newspapers including the National Enquirer and the Star Ledger News highlighted the program. CosmoGirl, ‘Teen, Teen People Magazine, and Good Housekeeping Magazine also profiled Hats Off For Cancer. Nineteen years and nearly 2,000,000 hats later, donations continue to pour in helping hundreds of thousands of deserving children. MISSION: Hats Off For Cancer is an organization that strives to reach out to children battling cancer, to make a child’s day a bit happier and their smile a bit brighter. 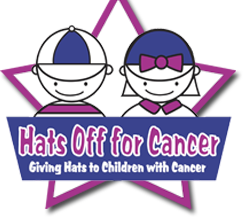 PURPOSE: The purpose of Hats Off For Cancer (HOC) is to provide children fighting cancer with something to make it more bearable by distributing hats donated via generous individuals, corporations, sport teams and celebrities. The battle against cancer can be especially difficult for children because they do not completely understand the extent of their disease. HOC has distributed nearly 2,000,000 hats to date in an effort to provide some emotional relief to the pain and confusion caused by cancer. STRUCTURE: Hats Off For Cancer is governed by a Board of Directors. The organization is facilitated by means of a central processing unit. Hat donations and financial contributions are received from around the globe. Organizations looking to donate hats, as well as receive hats, contact the National Hat Drive Coordinator for further assistance in holding a hat drive. Those interested in receiving hats contact the President or National Hat Drive Coordinator. The hats collected through donations or hat drives are then distributed to hospitals, camps, and organizations worldwide.